TRANSFORMERS UNIVERSE. 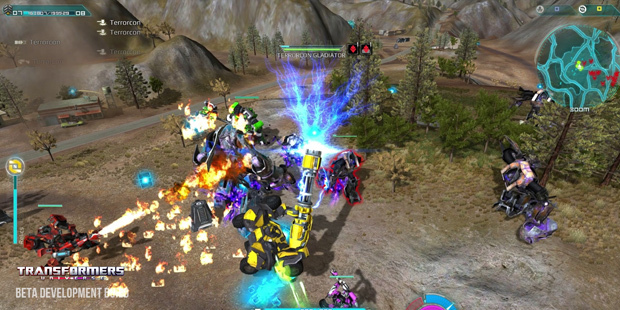 Macro is joined by his Decepticon peer, Firebreaker, and together these two polarize tactics on the contested battlegrounds of the game. Macro, in his warrior form, carries a heavy broadsword for up close melee combat which he wields like a chivalrous knight. In addition, his shield dome cloaks all allies within its boundaries, removing them from enemy line of sight for a limited time. At the other end of the spectrum, Firebreaker is the first Decepticon in TRANSFORMERS UNIVERSE to feature cloaking capabilities. Sacrificing his shield meter he can extend the duration of the cloak, and can also unleash a computer virus on himself that will devastate the first Autobot he comes into contact with. “From Soundwave to Grimlock, Transformers has always championed diversity and we’ll continue to complement this within our game. As such, the dynamics of the TRANSFORMERS UNIVERSE battlefield will once again shift with the introduction of Macro and Firebreaker, thanks to their distinct combat skills and specialities. Plus, our burgeoning community has been clamoring for Macro for a while now, so it’s fantastic to finally launch him into the game!” said David Nicholson, vice president of TRANSFORMERS UNIVERSE. So 2015 has come and gone, and Digital Extremes closed out another successful year for their highly praised F2P co-op title: Warframe. Nexon Europe announces its newest title, United Eleven, a football (soccer) management game with officially licensed players.